The New Jersey Devils are looking to reclaim sole possession of the top spots in the Eastern Conference and the Atlantic Division. To do that, they'll need to rebound from a difficult loss to a division rival on Friday when they host the woeful New York Islanders. The Devils (42-24-7) are one point behind first-place Montreal in the conference, and are tied with Pittsburgh atop the division. New Jersey, though, has nine games remaining, two in hand on Montreal and one on Pittsburgh. The Devils settled for one point Wednesday when they allowed a goal with 4:46 left in regulation before losing 2-1 in a shootout to the New York Rangers. "We're not in the playoffs yet, so every point that we get is closer to a playoff spot," said Devils goaltender Martin Brodeur, who made 20 saves in regulation before allowing the lone shootout goal to Nigel Dawes. "Definitely we're happy about getting one point. We wish we could have two." 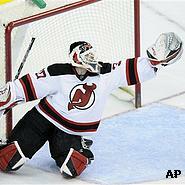 Despite the loss, Brodeur is 5-1-1 with a 1.80 goals-against average in his last seven games. He's held opponents to less than three goals in eight of 10 games at the Prudential Center, going 6-2-2 with a 1.85 GAA in that span. That included a 19-save performance in a 4-2 win over the Islanders on Feb. 23 in which he also had an assist. The Devils used a dominant third-period performance in that contest, scoring two goals in a third period in which they outshot the Islanders 20-4, ending a six-game losing streak to them. Zach Parise - New Jersey's leader with 30 goals and 61 points - has three goals and two assists in six season meetings against the Islanders, including one of each in the last matchup. The left wing, though, was held pointless by the Rangers, and has only one assist in four games. The Islanders, who are 13th in the East, are looking to avoid matching their season-high seven-game slide from Jan. 24-Feb. 9. They have dropped eight of their last nine, with the lone victory a 4-3 shootout win over the Rangers on March 4. Their struggles continued Tuesday as they gave up three third-period goals in a 3-1 home defeat to last-place Toronto that left coach Ted Nolan fuming about his team's lack of intensity. The Islanders have been outscored 26-9 during their six-game skid, and they are last in the NHL with 177 goals. Their lone goal against the Maple Leafs was scored by Rob Davison, who was clearing the puck from the defensive zone and it bounced past Vesa Toskala 178 feet away. Bill Guerin, the Isles' leader with 22 goals, has only found the back of the net four times in the last 27 games after netting 10 goals in the previous 14 contests. That stretch included a two-goal performance in a 3-1 win at New Jersey on Jan. 16, but he was held off the scoresheet in the next meeting.